Immersive theater can be vexing—take it from a critic who’s slogged through productions set on sinking long-tail boats and in allergenic warehouses—but this year’s been a grand one for location-specific opera. I’ve walked Manhattan High Lines and been spooked at crypts. And now, just in time for Christmas, I’ve run out of Kleenex during perhaps the most moving encounter of all: On Site Opera’s sole full production this season, Amahl and the Night Visitors, which is staged in a soup kitchen at Chelsea’s Holy Apostles Church. For a sorely limited run (opened on Thursday, ends tonight), director Eric Einhorn provides Gian Carlo Menotti’s compulsory teledrama about the Magi’s visit to a disabled boy with a rendering that is not only detailed and poignant, but also perfectly on-topic with the times. This a sincere revival with a social conscience, a chance to take immersive part in the Christmas miracle, not just watch it remotely, from a balcony or living room. Menotti premiered his short work on NBC in 1951, decades before Carrie Underwood subjected us to her Maria von Trapp. The hope at the time was that it would be a popular opera families could watch at Yuletide from home. The composer’s wish came true, and the piece was performed annually live for over a decade, in many ways defining the seasonal sensibilities of an entire generation. Although some may dismiss it as schmaltz, the work’s popularity makes it easy to overlook what a fine piece of craftsmanship it actually is: the music is warm and vocalist-friendly, the libretto charming and taut, and the characters pulsating with a kind of inner-life that allows for multiple interpretations and portrayals. On Site, a company that delights in bringing the masses to art by mounting productions in obscure locations—thanks to them I recently got to experience an operatic reenactment of the 1911 Triangle Shirtwaist Factory disaster at a Synagogue in Chinatown!—has updated the setting, moving it from post-nativity Bethlehem to a homeless shelter in New York. They’ve also sagely teased out the central thematic of selflessness by partnering with Breaking Ground, New York’s largest provider of permanent supportive housing: much of the chorus has been plucked from that community, and most share their stories in the program notes. Ten-year-old Devin Zamir Coleman and seventh-grader Luciano Pantano are double-cast as Amahl. 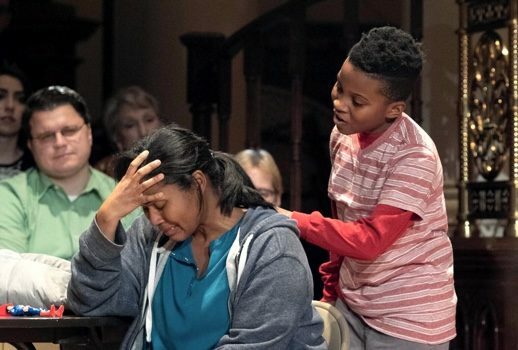 While I have heard good things about both boy sopranos, I only caught Coleman, whose sound on opening night was easy and lyrical, and whose acting perfectly captured the urgent perspective of a boy whose sole concern is his mother’s well-being. Even more revelatory and radiant was soprano Aundi Marie Moore, who makes her On Site debut with this production. Someone needs to record this woman very soon, as she is not even in her prime and yet already sounds like a young Audra McDonald: her unmannered, ringing tone perfectly complemented the composer’s fringe-musical theater style. Einhorn is a director whose creative instincts seem to improve with each new production of his I’ve seen. For Amahl, he wisely recasts his Wise Men as homeless drifters, complete with shopping carts, Burger King crowns, and ill-fitting getup. 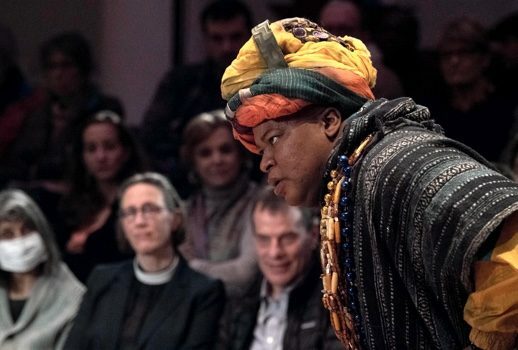 The effect, which I realize sounds crude and excessive in writing, in fact gave added resonance to the Magi’s ultimate act of generosity to Amahl’s mother, while rendering the opera’s emotional climax all the more powerful and wrenching. As Kaspar, tenor Joseph Gaines was at once hammy and lovable, delivering a darling “This is my box” aria that made my unfulfilled man-womb ache to adopt him. South African bass-baritone Musa Ngqungwana was a creamy-voiced Balthazar, his exchanges with Amahl especially winning. And granting Melchior an extra dose of compassion, baritone Daniel Belcher, a Grammy-winner who originated the part of Prior Walter in Peter Eötvös’ Angels in America in 2004, turned in an especially affecting performance of Menotti’s “Oh, Woman, You Can Keep That Gold,” an aria I usually need a Nuedexta to get through. Rounding out the cast was the charismatic bass of Jonathan R. Green as the Page, re-envisioned here as a kind of security officer for the shelter. An uplifting dance squad, choreographed by Winston A. Benons Jr., combined jazz and voguing styles. With all of these gifts, On Site’s Amahl is an advent calendar of a production—it gives and gives. I just wish it also gave us another few nights to appreciate its innovations, as I’d likely make a special pilgrimage to see it a second time.